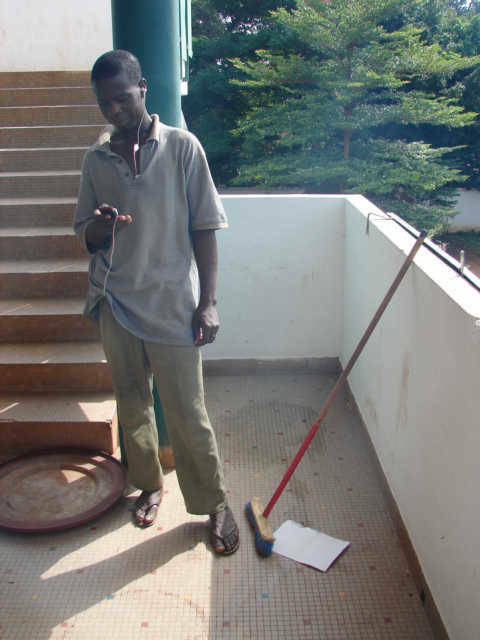 I took this photo of no less the cleaning man, the boy who swept the floors in this large Hostel in Bamako, Mali. I stopped him, asked in French to make sure, yes, this is a cell phone in his hand. The boy, man was sweeping the floor with this ear bug in his ear, I am thinking, that reminds me of the cell phone on the desk in the internet café in Accra, Ghana. 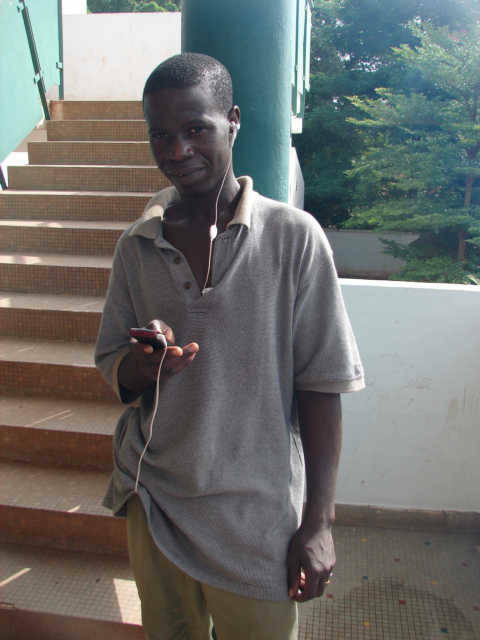 This man in Accra took his cell phone out, put it next to the computer and started making the room, me, listen to the music. Mali is I think number two from the bottom, the almost poorest country on the planet, the most under developed, the average pay should, or is about one dollar per day, this boy is supposed to be making one dollar per day, or is he? Smoking mirrors! He has a cell phone, portable they in French, and he has somehow downloaded or loaded music on the phone. He can now listen to it like a radio or something; I do not want to learn. I am really just annoyed, the coupling of cell phones and music is the beginning of the end, the ambient sound around me is growing, the world continues to turn up the background noise. I will need to go to Antarctica to find some quiet. Turn up the background noise, it is driving the world nuts, the cities hear this louder and louder noise, they ignore, or do they, I think the world slowly gets more stressed. The lowest country on the planet is turning up the volume, and they say they do not have money, they have cell phones as this is more important than screens on the window to stop malaria.